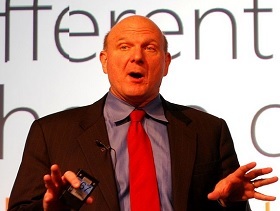 During Steve Ballmer’s 13 years as Micro­­soft’s CEO, the company’s revenues tripled and its profits doubled. But the man who replaced Bill Gates also took some criticism. Ballmer, 57, who has stepped down as CEO, admits that he made mistakes. He confesses that sometimes “we waste [money] or we take a false step,” but he also says the goal is attaining long-term growth. Reflecting on lessons learned, he believes a CEO needs to focus on big-picture analysis. Taking a narrow view can prevent a leader from having “enough perspective to have an intelligent opinion,” he says. Seeing the entire playing field is especially vital in the technology industry. For Ballmer, a visionary leader needs to make big investments based on perceiving the landscape well into the future. Ballmer rejects the wisdom that top leaders surround themselves with A+ players and let them run free. He has found that it’s better to work in tandem with top employees so that everyone’s on the same page. — Adapted from “5 management tips from Microsoft CEO Steve Ballmer,” Mary Jo Foley.